The achievements tool allows instructors to designate criteria for issuing rewards to students. Much like the Early Warning System, rules can be set as the criteria for issuing achievements. Unlike the Early Warning System, the achievement tool rewards students for their accomplishments, rather than punishing or identifying detrimental behavior. Students can see which rewards they’ve earned and what is required of them to receive additional rewards. Instructors can award badges for the completion of a project, mastery of a skill, or to signify the achievement of levels of experience. A collection of badges can represent the key learning milestones that have been met. They can show a complete view of a person’s skills and achievements. Want to reward your learners for holding a 90% or higher in all their Assignments? Want to award a badge for students who displayed mastery in their Midterm? How about rewarding your learners for participation in the discussion forums? These opportunities are possible by utilizing the Achievements tool. As you brainstorm ways to reward your learners, keep in mind you can set rules based on Grades/Performance, Dates, Group Membership, and Review Status. Basically, you can allow students to combine a diverse set of badges to tell the story of their accomplishments, in and out of class. Together, you can create badges to spotlight skills that will help students work toward a specific goal. Whether the goal is to gain admittance into graduate school or finding the perfect job, you can collaborate with your students to design the pathways. Access the achievements tool from the Control Panel > Course Tools -OR- from a content area > Tools on the action bar. On the Create Achievement page, provide a name. Select a presentation location. Choose a place in your course where students are likely to earn the badge or certificate. Students are presented with the content item and a notification of the new item. Course Completion: The certificate reward is required. An additional badge is optional. Milestone: The reward can only be a badge. Custom: The reward can be a badge, certificate, or both. Determine if students can see the existence of the achievement before earning it. Choose Yes, if the reward is meant to motivate all students. Choose No, if there are special rewards that will only be granted to specific students that should not be seen by everyone. Optionally, type a description. This description should clearly define what you expect students to complete to earn the associated reward. Optionally, use the functions in the content editor to format the text and add attachments. Click Define Triggers to continue. 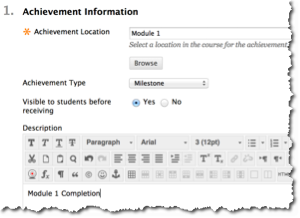 Note: An achievement is not be presented to students in the student view of the achievements tool until a trigger rule is defined and a reward is selected. Define Criteria Triggers for AchievementsFor an achievement, you can define one or more rules that will trigger the release of the reward. You must define at least one rule. Note: Setting a Display After date means that students cannot earn the reward before that date, even if they have already met the criteria. Display After is not the same as an end date and is not a deadline. To create a rule, name it, and set each criterion necessary for fulfilling the requirements of the achievement. 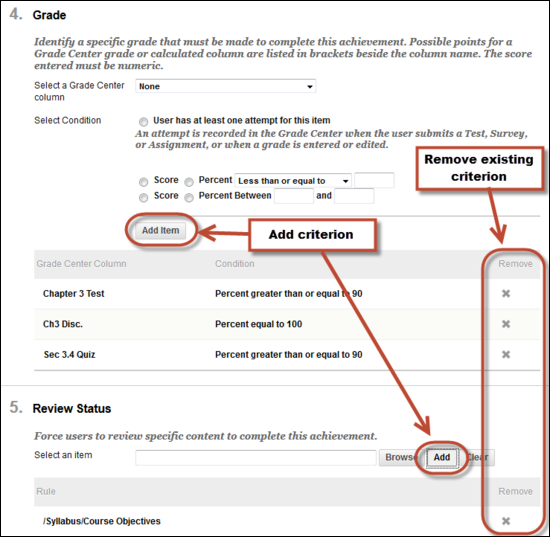 You can create additional criteria for grade and review status by clicking the add functions. In circumstances where different criteria are possible, click Add Another Rule to create another rule. For example, you have a group of learners who need accommodation and have different performance requirements to receive the reward. To manually award an achievement, use the membership criteria options to select the recipients. For example, you can award a mayor badge for leading discussions. Click Select Reward to continue. On the final page, choose the reward. Depending on the achievement type, you can choose from different options. You can preview how a certificate will appear to students. It includes the issuing institution as specified by the administrator, the user’s name, the course name, and the date the criteria of the achievement were met. For badges, you can select an image from the catalog or upload a custom image. 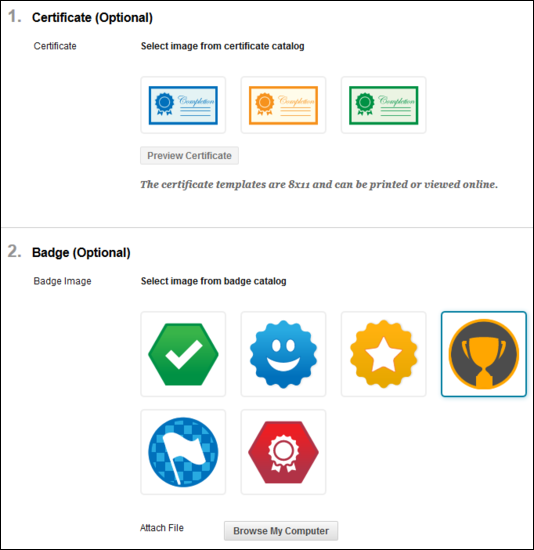 An uploaded badge image is available for reuse within your course. If you uploaded an image and need to remove it, you can delete the file from Course Files in the achievements directory. Uploaded images are automatically resized. The issuer name is prepopulated based on the administrator’s settings. If appropriate, and allowed by the administrator, you can modify the issuer name. You can specify an expiry date for the badge and, if allowed by the administrator, the badge can optionally be available for publishing to recipients’ Mozilla Badge Backpacks. Select Submit to issue the achievement. Students can access the achievements tool on the Tools page, from a tool link on the course menu, or from a link in a content area. You can see a student’s My Achievements view by clicking a student’s name in the Recipients pane. The page will appear exactly as it will to that student. Today’s post covers another new Service Pack (SP) 13 feature/tool for faculty at Sam Houston State University. For ages, Blackboard instructors have looked for a way to change multiple dates for tools and content at the same time. The wait is over! Your semester switch-over just got that much easier thanks to the Date Management tool available in Blackboard. The first step of date management is to decide if you want the system to automatically adjust the previous or current course item dates to new dates. A. Select Use Course Start Date or Adjust by Number of Days to adjust the date accordingly. NOTE: If your school uses term, you can select Use Term Info. Use this option when adjusting for new terms. Adjust dates according to the course start date. The current start date is shown, along with the new course start date (pre-populated if available). If content was copied from an old course shell, the system detects this and automatically populates the Current Start Date. The New Start Date expects the new course start date, and is automatically populated with the new course shell’s course start date (if set). The difference between the current and new dates provides the system with the offset days. All dates on copied course content is shifted by the offset days. If a due date was 10 days after the current start date, the offset days would move the due date to be 10 days after the “new” start date. Example: If a due date was 10 days after the current start date, the offset days would move the due date to be 10 days after the “new” start date. Adjust dates according to terms. The current start is shown, along with the new start date. If content was copied from an old course shell, the system detects this and automatically populates the current start date. The New Start Date is populated based on terms defined by your school administrator. The different between the current and new dates provides the system with the offset days. All dates on copied course content is shifted by the offset days. Use this option when you know exactly how many days you want to adjust dates by. Type the number of days you want to adjust all dates in the course by. This is based on the dates that are currently set for each item in the course, not today’s date. Example: On June 1 you adjust dates by 30 days. The assignment that was set to be due September 1 is now due October 1. Note: Negative numbers move the dates back. Positive numbers move the dates forward. Use this when you want to review dates before adjusting them. 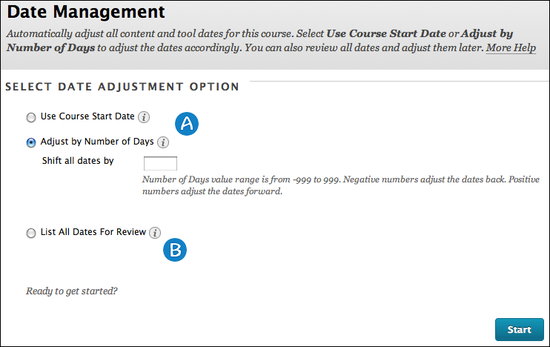 Select this option to display a list of all content and tools with dates in the course on the Date Management Review page. 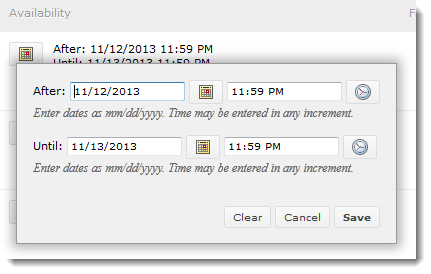 Use this option to review all of the dates and analyze them for adjustment. This page displays all content and tools with dates set in the course. Review all dates and adjust accordingly. A. Return to the first page and choose to adjust dates automatically. The first page also shows an inline receipt indicating when Date Management was last run. B. Refresh the current page to account for any changes that have been made to the course since date management was last run. C. Filter your review by item type (e.g. Assignment, Test, etc.). D. Filter your review by date type (e.g. Due Dates). E. Select one, multiple, or all items in the list to batch adjust dates. Adjust dates allows users to indicate by how many days the selected item dates should be moved by. A negative number would move the dates back. F. Click to sort the list by item name. G. Review and adjust the due date for item. Click to sort the list by due date. H. Review when items are made available. Click to sort the list by item availability start and end dates. I. Review the adaptive release dates for items. Click to sort the list by adaptive release start and end dates. J. Navigate between pages. By default, the page shows 25 items. K. Click the date or edit icon to edit any of the dates for an item. Note: The task due dates are moved during the bulk move process, and they do appear in the Review and Edit Dates Screen. 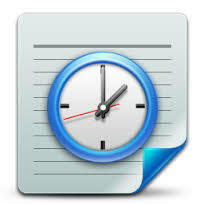 Date Management does NOT support editing of due dates for tasks from review and edit dates screen. 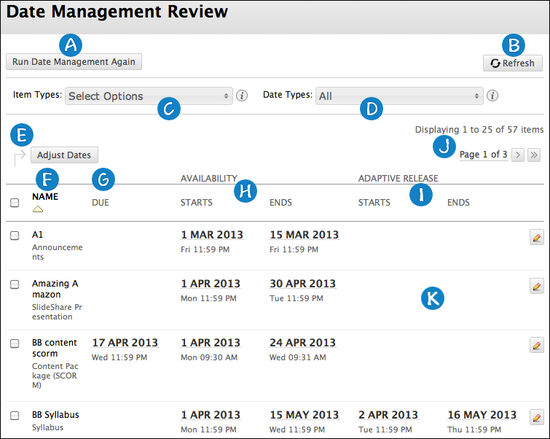 Publisher content is shown on the Date Management Review page. You cannot adjust the dates of publisher content from Date Management. 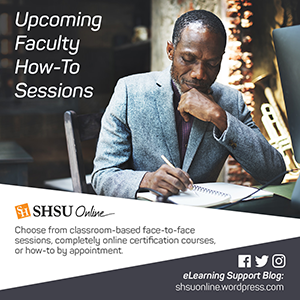 Starting Friday, December 20, 2014 at 12 pm, Blackboard will have some added features and settings that will improve the Blackboard experience for faculty and students at Sam Houston State University. The next few blog posts will cover new features and added benefits of Blackboard Learn Service Pack 13. These options can be found on the Test Options page of a Test deployed to a Content Area. Click Add User or Group to search for course users and groups to add to the exception list. Use the Add User or Group window to search for and select the course user or group for whom the exception is being created. Note: If you choose to use groups, you must make the group unavailable if you do not want students to see group members. Select the user(s) or group(s) you wish to add to the exception and press Submit. You can then create exceptions for the user(s) and/or group(s) you selected based upon Number of attempts, timer, availability and force completion. Check or uncheck the box for Auto Submit to enable or disable it for this exception. Note: Timer and Force Completion must be enabled in the previous Test Availability step to enable those settings for Exceptions. Use the Calendar button under Availability to enter availability dates for this exception if the dates are to be different from the initial Test Option dates, otherwise the dates set in general Test Options will be inherited. Check or uncheck the box for Force Completion to enable or disable it for this exception. Note: Timer and Force Completion must be enabled in the previous Test Availability step to enable those settings for Exceptions. Click the X at the far right of an individual exception if you wish to delete it, or click Remove all Exceptions to delete all exceptions for the test. Note: If a Due Date is set on the test, and the Do not Allow Students to start the Test if the due date has passed option is checked – it MUST be unchecked to allow any date availability exception to function beyond the due date set. Each new year brings new growth, new ideas and new commitments for us to do things to make ourselves better personally and professionally. Whether we are inspired by too much turkey over the holidays or an urge to start with a clean slate, no other time of the year seems more appropriate for these determinations. Perhaps this year, we may consider some New Year’s Resolutions for our online courses! Let’s face it, online teaching, like too much turkey, can really weigh you down. During a long semester, we can get buried in grading assignments and responding to discussion posts, and the lofty goals we started off with for engaging our students can seem dimly out of reach. With a holiday break and a start to the new year/semester fast approaching, now is a great time to resolve to adopt a few pedagogically sound teaching and learning best practices for our online courses. While there may be several measures we can adopt to improve the overall quality of our online teaching environments, here are five easy to follow, easy to apply techniques that will make our online courses that much more engaging. Remember you don’t have to do all 5! 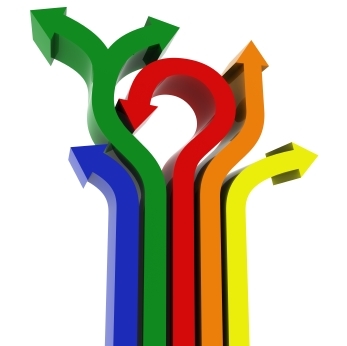 A smart move for any online instructor is to implement some kind of ‘orientation unit’ for the online student. This unit can serve the purpose of introducing the student to his or her online course environment, as well as other important course information. Expectations, rules of the road, and an operator’s manual are usually communicated within this unit. It is important to set this unit up just like every other unit in the course. Model orientation content and activities in such a way as to reflect how the rest of the units will be structured. The student will not only gain the benefit of understanding how the online course operates, they will get the added practice of going through course units as they would normally throughout the course. We would be hard-pressed to negate the notion that are our students are not identical. Each of our learners comes to us with varying degrees of abilities, aptitude levels, interests, learning experiences and needs. While it may not be feasible to get to know each of our students on a personal basis, we can make some general deductions about the learning diversity that is present in every course we teach. This is where Differentiated Instruction comes in. For those of us in the field, the term refers to the theory that since no two students will learn exactly the same way, instructors have the opportunity to structure and design their teaching environments using a variety of instructional methods that may reach a broader swath of the student body. The online environment really lends itself to this approach. With the advent of various technology tools, we can now choose to diversify our approach to lectures, activities and assessments and more. If you are wondering how to add more diversity of instruction to your course, start with the following. It’s as easy as A-B-C! a. Realize your students are unique, and discover ways to get to know them. Realistically speaking, we may not get to know our students as well as we would like. But we can implement an activity or two to catch a glimpse into who they are and what their learning approach may be. For instance, at the beginning of your course, introduce an ice-breaker discussion forum and ask your learners what they do in their free time. You will be surprised by what you can learn! b. Look critically at your course, and identify a few areas where you can introduce diversity of instructional methodology. Sit back and consider your students’ learning objectives. Take a look at how you are introducing and enforcing these key concepts at the moment and select an area or two where you may introduce a different approach. Perhaps an audio lecture may be a welcomed alternative to the text-based reading. Or, perhaps you may want to spice up your course with content from the Khan Academy, Ted Talks, or NBC Learn. Often regarded as “mashups” the introduction of external collective knowledge in an online course adds variety, and piques students’ interests. c. Consider the Context and Role of the Online Instructor. The online environment can present us with options we may not have readily used in our face-to-face courses…so make the most it! While having lots of choices may seem daunting, starting with one or two will help keep them manageable. Online Instructors should think differently about their teaching, because in the online environment where rich, educational online resources abound, we become more of a guide on the side, than a sage on the stage. This resolution is an easy one to keep! First, learn your Technology Support Desk hours (SHSU Online is 7am – Midnight, Mon-Sat). Once familiar with Support’s hours of operation, make sure any due dates, tests or technology oriented activities fall when the Support Desk team is available. This is important because the students will have someone to call when the technology doesn’t work or their interpretation of how the technology should work is different from actually happened. Part of being available in a course, and establishing ever-important instructor presence, is letting your students know when you are available. A great way to do this is to establish a routine for your course interactions. Hold regular “office hours” with the asynchronous chat tool (Skype, Bb Chat or Collaborate, Google Hangout) where you will be available in real-time to answer your students questions if need be. Post an announcement and send it out via e-mail once a week summing up the previous week’s events and highlighting the important aspects of the next week. By establishing a routine, you form a habit of being available in your course that your students can count on. Remember the excitement of teaching? The opportunities to lead, change, inspire, and innovate? Perhaps you connect with the intrinsic motivation of knowing you are making a real and tangible difference in many impressionable minds. Whatever that original point of motivation is for you, we can all connect with what originally prompted us to teach. Being an online instructor is the perfect chance to express your teaching philosophies in a number of diverse and effective ways. Make your course as exciting as your teaching. Personalize it. Make it your very own. Let it show your unique teaching style and at the end of the day, resolve to have fun doing what you do best…teach!